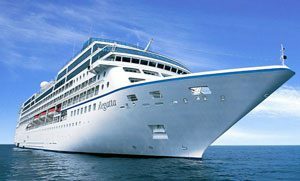 The Oceania Regatta received a major refurbishment in 2014, prompting Cruise Critic to call the Regatta “one of the most beautiful ships at sea.” Renovations included updates to suites and staterooms, a complete renovation of the main dining room, the addition of a Baristas coffee bar, upper deck pool and sports area enhancements, a renovated spa, and refurbishment of the ship’s lounges. Cabin options include a variety of suites, balcony staterooms, ocean view staterooms, and inside staterooms. 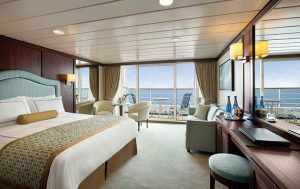 A large percentage (about 70%) of the ship’s staterooms have private balconies. Cabins feature “Prestige Tranquility” beds with 1,000 count linens. 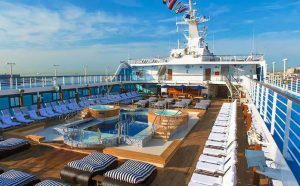 On board amenities and activities include the Canyon Ranch Spa, three boutique shops, a library, a pool and sports deck with putting greens, a variety of bars and lounges, and a casino. Afternoon tea is served daily at 4:00, with tea, pastries, finger sandwiches, and live music performed by a classical string quartet. Dining is provided in four open seating restaurants. The Grand Dining Room serves from a menu that changes daily, with a choice of at least ten appetizers, soups, and salads and twelve entrees at dinner. The Polo Grill provides classic steakhouse dining with an emphasis on steak and seafood. Toscana is an elegant Italian eatery. The Terrace Cafe provides casual indoor/outdoor dining. And Waves Grill is casual dining with a menu of All-American favorites.